These solutions I am currently using are for 1/48th scale miniatures. 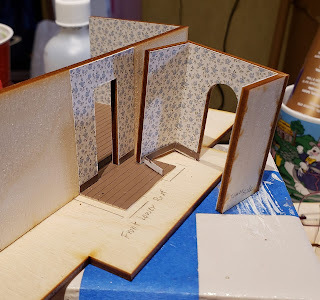 This photo shows the 1/48th scale wallpaper in photo sleeves. these sleeves happen to fold which gives twice the space. 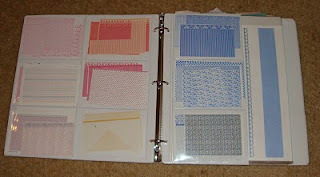 I have them in a standard three ring binder. In addition the photo sleeves I have used some full size page protectors for various other pieces of wallpaper that is 8 1/2 inch x 11 inch or smaller but not as small as the photo sleeves. 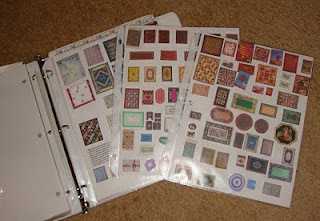 This second photo shows the same binder with pages for storing rugs and quilts. First I used a full sheet page protector. the white sheet is just a plain piece of paper that I have used double sided temporary tape to attach the rug or quilt. I grouped the rugs by color and theme. When I find a rug I want to use, I can easily remove the page and peel off the rug and slide the white sheet back into the page protector. All of the components I am using in this storage solution are recycled, but they should be easily found online from a office supply store. The photo sleeves came out of a photo album that was a three ring binder but was narrower than a standard binder and is why the fold over. Certainly other photo albums could repurposed for similar storage solution.